Hand made aromatherapy essential oil diffuser. Hand made in Bat Trang Village. Size: 4"x 3"
Beautiful, hand made ceramic diffuser made for aromatherapy with zen designs. Great gift, beautiful, authentic and functional. We recommend essential oil for health benefit. It's easy to use, no need to plug in. You don't need to add the tea light candle to enjoy the aroma. If you do, The real tea light candle or battery one will will create the beautiful reflection. The opening is easy to insert the tea light. The bowl is deeper than other design so it won't burn out. The distance of the bowl to the bottom is perfect to just warm the oil, not burn it, best for health benefit. Artistically, these ceramic diffusers are much more beautiful than plastic plug-in diffuser. They won't give out chemical or too much of water condensation in your room. Keep this diffuser permanently in your bathroom with few drops of oil (mix it with water) to create the "spa" bathroom. 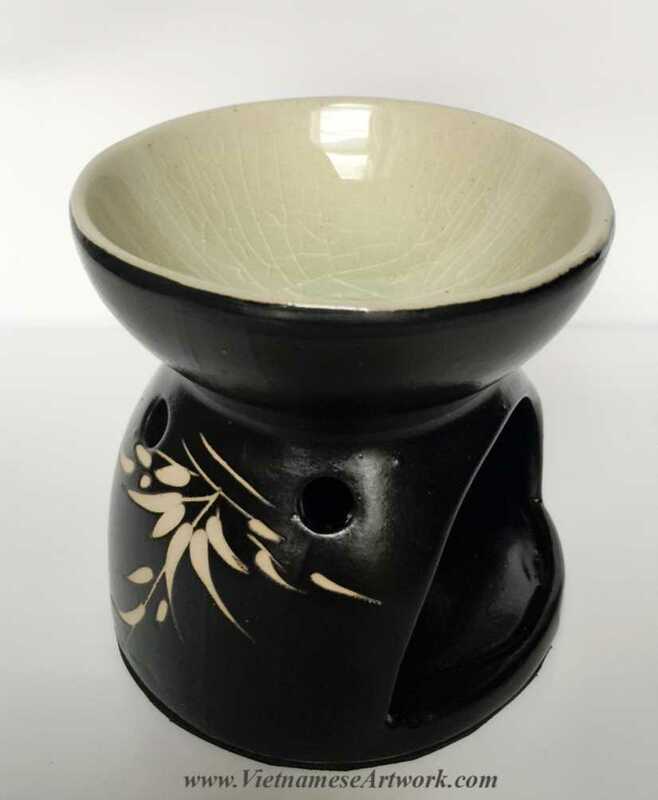 Using this Vietnamese oil diffuser is a romantic and classy way to make a relaxing night. They are beautiful decor for any room and make perfect gift for all occasions. You can use them for bathroom, spa nights, powder room, party and entertainment purposes. Please be mindful when using real tea light candle!